The plant commonly called “Kabog” in the municipality is a small seeded annual cereal and forage grass. It may have a name other than “Kabog” but this is now lost due to constant reference to it as Kabog by the people. It is any of the several grasses related to the common millet. Kabog is often mistaken for “dawa” fof they belong to the same family of grasses. However, they differ in color and shape. The former is circular while the latter is oblong in form. Dawa is orange whereas Kabog is yellowish in color. The grass “kabog” used to grow wild and abundantly in the mountains of Catmon especially in and around the vicinity of Barangay Agsuwao. But when the people realized that its grains could be utilized for food, they stared cultivating “kabog”. So, now patches of kabog forms can be found in the barangays that are hilly and mountainous for the kabog grass grows well in terrains like these. Not so long ago, the people who had the occasion to get inside a cave in barangay Agsuwao found small piles of grass stalks scattered everywhere. They recognized these to have come from wild grasses growing in some parts of the barangay. They wondered at first why these were found inside a cave. Later they discovered that the bats known locally as “kabog” roosting inside the cave brought them from outside for their food. The population of Kabog in the cave found the seeds of the grass to be good food for them. Hence, the piles of stalks inside the cave. An enterprising Catmonanon gathered the seeds and cooked them. He reasoned that what was good for the birds could not be a poison to man. To his dismay however, the cooked seeds where coarse and bland in taste. Undaunted, he pounded them before cooking and added sugar. The result was tasty and most filling. Soon, the people experimented ways of enhancing the taste of the cooked seeds. One culinary preparation of the seeds that became popular and gained prominence was cooking the seeds with sugar and coconut extract (tono). The result was so tasty and delicious that people served it only on special occasions. When served wrapped with banana leaves, it was called “budbod”. To differentiate it from the budbod pilit made from rice, the community called it “budbod kabog” to show that the delicacy was made from seeds that was the favorite of the bats known locally as “kabog”. Up to the present, the delicacy bears the name. Budbod Kabog were first sold at the toll house of Naghalin Bridge. The place was most suited to commercializing the delicacy for it was adjacent to the old cockpit. Besides long distance bused did make the place a stopping point for snacks. Nowadays, budbod kabog are sold at the Native Chicken and the Cooperative. With the declaration of Cebu as the festival capital of the country and the desire of the Local Government Unit of Catmon to boost tourism and further promote the native delicacy “Budbod Kabog”, the municipality has decided to rename and reformat the Sadsaran Festival to “Budbod Kabog” Festival. Except for the incorporation of activities intended to promote the natural delicacy, the festival retains the Sadsaran format which entertained people for the past long years. 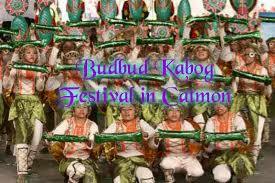 The ‘Budbod Kabog” Festival as envisioned and conceptualized does not replace or delete Sadsaran but instead it has enriched it with more festive and substantive activities. The “Budbod Kabog” Festival has four main activities. These are the Search for the Festival Queen, the Sadsaran (Street Dancing) in the afternoon of the fall, the Budbod Kabog Dance Showdown and the Grand “Patikim” where the people get to taste budbod kabog and other culinary preparations utilizing the grain “kabog” such as bibingkang kabog, bikong kabog and kabog valenciana. Other delicacies of the municipality will also be showcased - bibingka, coconut balls, peanut brittle, empanadita and many others. The Budbod Kabog Dance Showdown is a dance contest featuring the original dance steps created by choreographers Mrs. Arlene Menchavez, Mr. Dioso Branzuela and Mr. Nelson Ares. The different contingents may present any dance provided they incorporate in the in their presentation the eight budbod kabog dance steps.